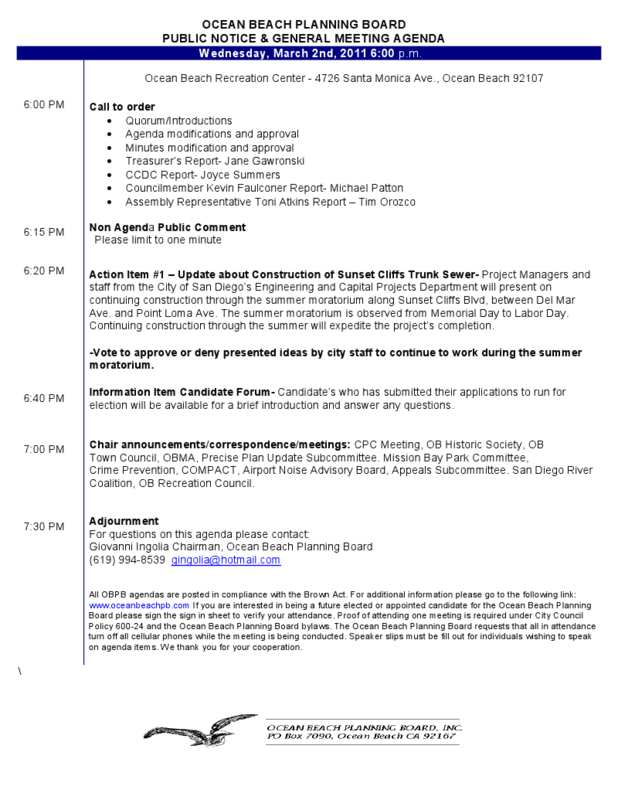 Here is the agenda for the Ocean Beach Planning Board’s meeting on March 2, 2011. Their monthly meeting is at the OB Rec Center, 4726 Santa Monica Avenue, and begins at 6pm sharp. As a reminder, the annual election is set for March 15th. I GUESS i AM EITHER LOST OR STUPID…..is this the location for the ” meeting ” about the VFW hall location ?? No Thinking- The agenda sets the schedule for the Planning Board meeting of that day. If you wish to speak on non-agenda items there is a one minute per speaker courtesy provided for in the “Non Agenda Comments” of the agenda. OK? So it is just a bunch of folks saying their peace tomorrow nite ? Flyer I saw has the Elections on the 15th. Please confirm. 13th is a Sunday…It has never been on a Sunday in the past. Whoops! I had earlier written that the OB Planning Board election is on the 13th. I was mistaken – it’s on the 15th of March.